Patent pending IceFree Liquid Chilling Systems™ is freeing the bar and restaurant industry from the expensive, high-maintenance production, storage and replenishing of solid state ice for the cooling of beverages in speed wells and bins. Continuously recirculating 31° super-chilled water maintains its liquid state saving significant power, water and space while achieving 100% prime surface area contact with bottles and cans. The frigid flow expels heat energy 24/7/365 chilling beverages more quickly and thoroughly than ice. IceFree™ is changing the state of chill. The result is never-before-realized efficiency, bringing power, water, time, labor, maintenance, space and profits back to bar owners and business, while dramatically reducing environmental consumption AND delivering the coldest beverage you'll ever taste. 75% power savings compared to solid ice production. Continuously flowing 31° water delivers immediate reduction in beverage cooling costs. Free up resources formerly frozen in the costly acquisition, operation, and maintenance of ice-filled beverage bins. 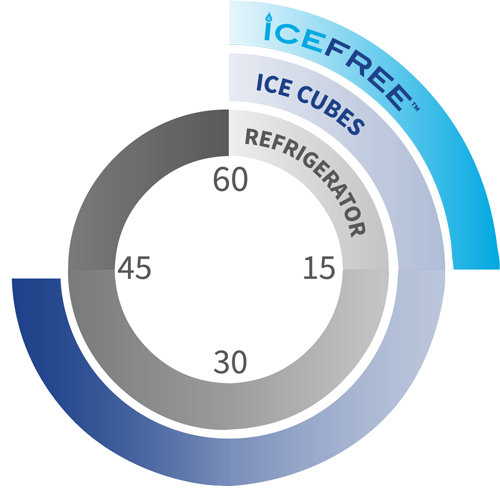 Water consumption savings are infinite once IceFree™ is flowing in your bins. 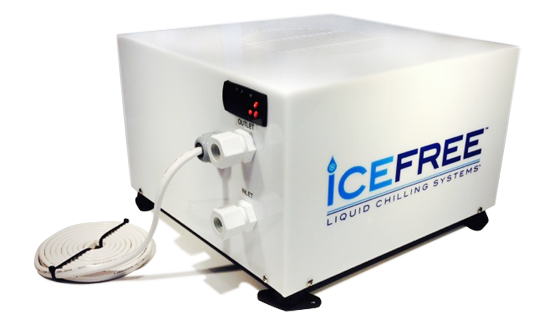 Self-monitoring, continuously recirculating liquid chill expels heat energy, maintaining 31° flow, 24/7/365. Clean. Clear. Continuously Recirculating 31° water achieves unprecedented efficiency in cool. Simply fill and chill. The chill is in the water... Let it flow! Cool more, faster with 100% prime surface-area contact. Frigid flowing water drops beverage temperatures 3 times faster than solid ice. Reassign the bar-back to more profitable tasks - No more replenishing. Bar backs see inventory effortlessly and restocking is as simple as placing it in water, organized and accessible! Self-monitoring, continuously flowing 31° water significantly deters development of yeast or bacteria buildup, while filtration administers ongoing treatment to recirculating water in bins. Bin water-level control, filtration and bacterial growth inhibitor come standard, fully integrated and never stagnant with IceFree™. Stock more. See more. Sell more. Reclaim space for value-add storage or additional retail where icemakers used to be. Open an outdoor bar or place tables, ready to serve, in the space newly available! where capital flows back to YOU! WATER. Infinitely less water needed for continuously recirculating chill. TIME. Chill in 1/3 less time of ice. Quicker more thorough cool. LABOR. Restock less often and relieve the barback to more valuable work - no more ice runs and replenishing. MAINTENANCE. Leave the standing water and costly service agreement in the ice age. Keep it flowing 24/7/365 in the fully incorporated, clean IceFree™ state. SPACE. Fit more bottles and cans in bins for chill-ready service and optimize the space once reserved for ice machines for greater profitability. • Go Green Get Green . Recycle chilled water through closed loop system. Unit Dimensions 79" x 30" x 34" 18" x 18" x 13"
This comparison measures how quickly a container beverage cools in each method at fifteen minute intervals with water circulation.